French® designs, manufactures and supports custom hydraulic presses for rubber molding, composite molding, laminating, forming, bonding and various additional applications. 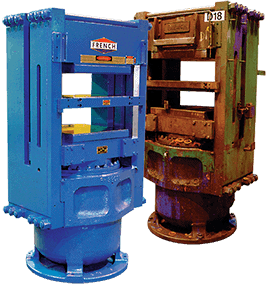 Hydraulic presses can be designed with capacities ranging from 20 tons to 2,000 tons, with various heated platen sizes, for compression, transfer, lamination or vacuum molding. French hydraulic press engineering designs are continually being improved by quality driven programs and with enhancements in automation and advanced electrical control systems. Our hydraulic presses are well known for their superior value, very low deflection, rugged construction, patented taper keys, long life and industry-leading three-year warranty, all of which optimize your process, improve part quality and give you the lowest life cycle costs. 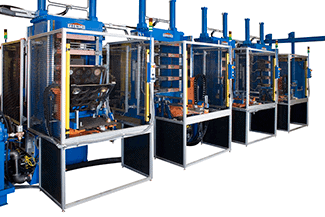 In addition to our own line of hydraulic presses, French offers laminators, rubber molding presses and composite presses engineered by TMP, A Division of French. French owns the exclusive license from Acrolab to sell Isobar® Super Thermal Conductors and for the manufacture and sale of Isoplatens® within the rubber molding and processing industry in North America. Isobar® and Isoplaten® are registered trademarks of Acrolab Ltd.